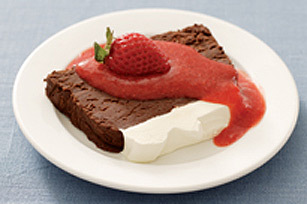 Tantalizing chocolate truffle with a fruity strawberry sauce: perfect for a special occasion. Line 8x4-inch loaf pan with plastic wrap. Microwave chocolates, butter and corn syrup in medium microwaveable bowl on HIGH 2-1/2 min. or until chocolates and butter are completely melted, stirring after 1-1/2 min. Cool completely. Stir in vanilla; cover. Refrigerate 30 min. or until thickened. Remove 1/2 cup of the whipped topping; place in small bowl. Cover and refrigerate for later use. Gradually add remaining whipped topping to chocolate mixture, stirring constantly until well blended. Spoon into prepared pan. Refrigerate 3 hours or freeze 1 hour. Unmold onto serving plate; remove plastic wrap. Let stand 15 min. Top with reserved 1/2 cup whipped topping. Cut into 12 slices. Place 1 slice on each of 12 dessert plates; top each with 2 Tbsp. of the pureed strawberries and 1 fresh strawberry. Store leftover dessert in refrigerator or freezer. You'll know it is a special occasion when this rich-and-indulgent dessert is served! Prepare as directed, spooning chocolate mixture evenly into 18 paper-lined medium muffin cups. Remove paper liners before serving. Makes 18 servings, 1 dessert cup each.